In Riviera Nayarit luxury is our magic. This luxury is the result of the efforts made by each and every one of the hotels affiliated to the Hotel and Motel Association of Bahía de Banderas. Their work became evident last May through the numerous awards that Resorts Condominiums International (RCI), the largest timeshare corporation in the world, offered to properties of Grupo Vidanta in their Mayan complex in Nuevo Vallarta. 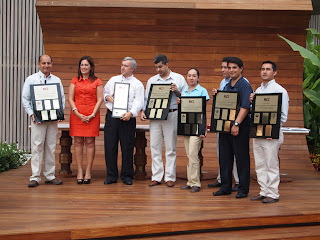 Juan Ignacio Rodríguez, RCI Vice-President of Business Development in Mexico and Central America, presented the Gold Crown award to Mayan Palace, The Grand Mayan, Grand Luxxe, The Bliss, The Grand Bliss and Ocean Breeze, all located in Riviera Nayarit. Furthermore, the Excellence in Service award was conferred to The Grand Bliss – a recognition that has been bestowed to less than 50 properties in the world. All the awards offered by RCI to properties of Grupo Vidanta in Mexico’s Pacific Treasure were ultimately a decision of the tour operator’s clients, as they rate properties through satisfaction surveys, which allow the company to identify their best properties. The Convention and Visitors Bureau (CVB) of Riviera Nayarit congratulates Grupo Vidanta for their constant efforts to improve the quality of the products and services they offer, as they contribute to create a better experience for tourists in our destination, and therefore support the marketing efforts being made by our destination. RCI was the first timeshare company to use its properties in this innovative touristic approach. It began operations in 1974 and today has over 4 million affiliated touristic developments.